Mutual recognition is generally forgotten in debates about new modes of governance, even though it is a particular powerful example. Its invention was crucial for the completion of the European Union’s single market, and in the late 1990s it was transferred to the field of Justice and Home Affairs. Outside of the EU, mutual recognition is also gaining in importance. 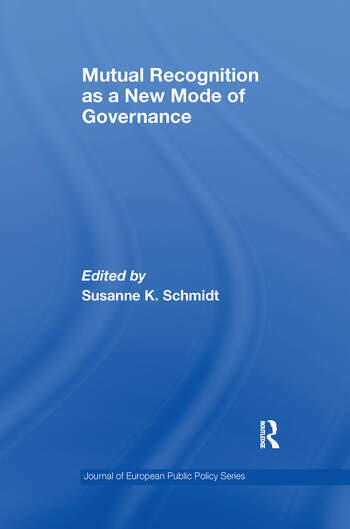 This book discusses mutual recognition in the context of the debate on new modes of governance and analyzes its potential to solve governance problems, focusing on the preconditions it needs for its functioning (e.g. trust of the Member states), the positive implications of achieving coordination through it, as well as its negative side effects (e.g. the danger of a regulatory race to the bottom). Particular focus is on the contentious services directive as a prominent example of using mutual recognition. In addition, contributions look at the application of mutual recognition in the market for goods, in the area of Justice and Home Affairs, in tax policy, and in the World Trade Organization, so that the book achieves a comprehensive assessment of mutual recognition as a new mode of governance. This book was previously published as special issue of the Journal of European Public Policy.